It might sound like a cliche but I have recently discovered again that as we get older how we stop trying new things. The ‘I know better’ syndrome gets the better of all of us but just once in a while, we should make it a habit to try something new. 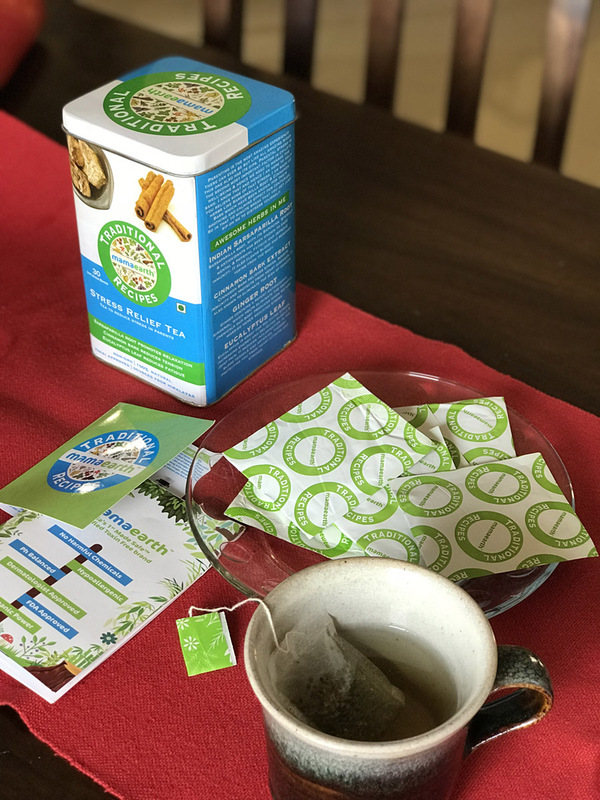 I discovered this recently when I thought that I had tried all types of infusion/green/medicinal tea over the years when Mamearth sent me package with their Stress Relief Tea and Apple Cider vinegar (more on that later) and I had two cups of it without giving it much thought. When I woke up the next morning I felt fresh and because my sleeping pattern has been erratic lately, also pleasantly surprised. But I hadn’t made the connection with tea yet. It only occurred to me later in the afternoon that it might have been because of the tea so I decided to try it again. As it turns out it wasn’t really a coincidence because I gave it to my father to test and he exactly that feedback. And I slept well three nights in a row! I hadn’t had tea like this before so naturally I was intrigued to do some research to understand really what makes it effective. Not surprisingly it had all the good things – an infusion of Eucalyptus leaf, Green tea, Ginger, Cinnamon, Cardamom. And I can say, without a doubt that I am happy to highly recommend this to anyone who is looking for a mild solution to stress and better sleep. You might take sometime to get used to the taste though. The other thing I found in the package was Apple Cider Vinegar. Now this was as alien to me as was oil mouthwash when my Chachaji introduced it to me the first time so I decided to do some research. The very first thing I found was that Mandira Bedi is a big believer in the benefits of ACV and I didn’t need any more convincing than that. I was converted. That was the start, as I started reading more, I couldn’t believe I hadn’t already discovered this (seemingly) fantastic potion of health. 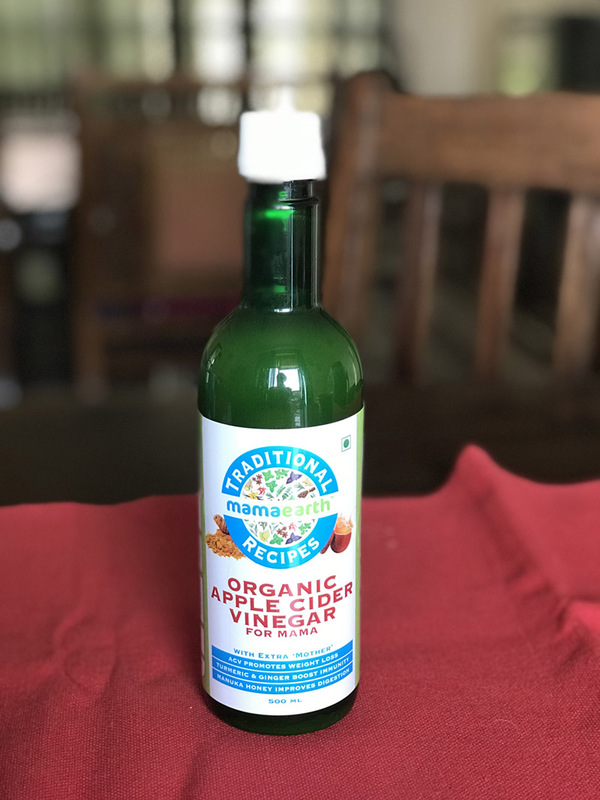 ACV is a completely natural product, brewed from the fermentation of apple juice to hard apple cider followed by a second fermentation to apple cider vinegar. This sour liquid retains all the nutritional goodness of the apples from which it was made plus it is fortified with the extra acids and enzymes produced during the two fermentation steps. It’s the final fitting of all these ingredients that give apple cider vinegar its amazing health benefits and amazing results! The vinegar contains potassium and Mamaearth ACV comes with goodness Manuka honey and ginger and turmeric root as well. *It is important to use organic apple cider vinegar and one that states it has “mother” in it. The “mother” is a natural gelatinous substance formed during the last fermentation step. Even though I know there is no way to determine the efficacy of it, however, you have to give it a try. It can take a while to get used to the taste but so did my oil mouthwash routine. I definitely feel lighter (probably as it cleanses the stomach) and I have been loving my skin lately. Having said that, a good diet and a regular workout routine is the most critical of all. co-incidence i must say .. just was going thru ur blog for 100 days sareepact & got to know about ACV as just yesterday had my 1st shot of ACV. Now am more confident to cont…after readiing ur views on it.